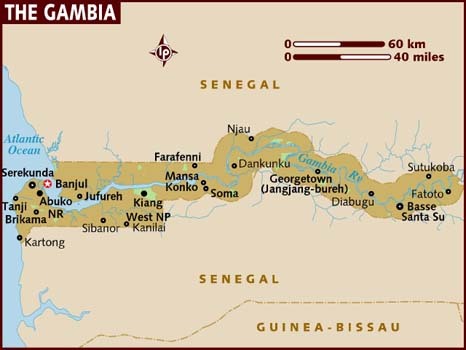 The Gambia is Africa's smallest mainland country, with a population of 1.7million. It is a former British colony that strides the banks of the river Gambia. Apart from its 50-mile long Atlantic coast, the country is surrounded by the French speaking Senegal. The capital is Banjul, a 6-hour flight from UK airports. The country is English speaking and on the same time zone as the UK. It is roughly the same latitude as the Canary Islands, with a similar climate. The country's economy is dominated by farming (ground nuts, cassava and millet), fishing and tourism.